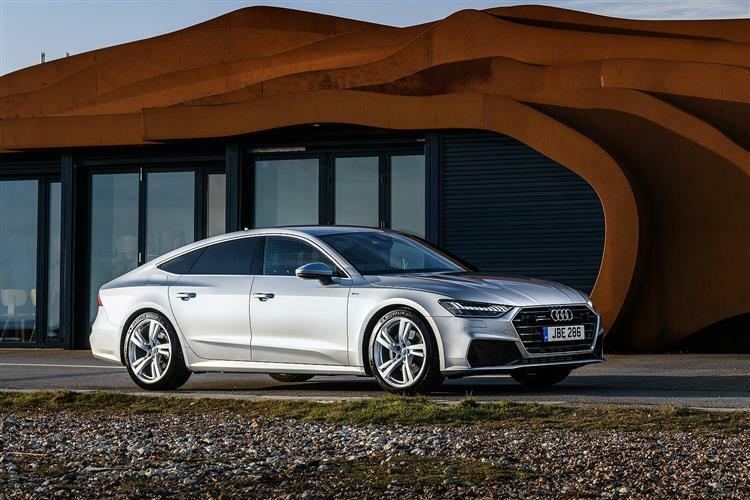 We have some of the best value Audi A7 lease deals available in the UK. Get a quote today for personal or business use and save money. Please contact us if you have seen a cheaper price and we'll match or beat any genuine quote. There is little doubt that the new Audi A7 is more pleasing than the last embodiment of the coupe. It’s more beautiful outside and in; it’s also far nicer to drive. Technology within the German car has been boosted too, with the engine now harnessing mild hybrid tech to heighten efficiency. But what’s the point of the A7 in Audi’s breadth of models? Well, the four-door car satiates the requirements of those looking for something more rousing than an A6 or A8 saloon. A coupe, or Sportback as Audi likes to call the shape, is arguably sexier. At the wheel, the latest A7 feels ready for anything, due to snappier steering and steadier body control in bends. Audi’s legendary Quattro all-wheel-drive technology gives it terrific traction, encouraging confidence on all kinds of road surfaces and in all sorts of weather conditions. Furthermore, barely any wind or road noise interrupts the calm cabin ambience at speed. This alone helps make it a superb commuting machine. But it’s the power on tap that truly gives the A7 the ability to hoover up hundreds of motorway miles painlessly. There are two six-cylinder engines to choose from – fed with either petrol or diesel. They utilise the mild hybrid system, referred to earlier, which operates through a belt-driven alternator starter. This ensnares energy during freewheeling or when scrubbing off momentum. It then stashes it in a lithium-ion battery pack underneath the floor of the 535-litre boot. The 3.0 TDI A7 sports a 50 TDI badge - and it’s the variant I drove. Regardless of the backlash against diesel, Audi reckons the oil-burner will, almost certainly, account for 80 per cent of A7 sales in Britain. It's clear that the automaker is right because it’s a joy to drive. Thanks to V6 vigour and a smooth eight-speed automatic ‘box, the A7 pulls like an InterCity. The 0-62mph sprint is over in 5.7 seconds, and the maximum speed is 155mph. Moreover, the mild hybrid gadgetry enhances economy by around 10 per cent, with the diesel managing 50.4mpg on factory-fitted 19-inch alloy wheels. But what about how the car looks? Well, there are some features that help it stand out from the last generation A7. These comprise an immense rear light bar that links the tail-lights and sleeker headlights. There’s also a tasty rear spoiler that only pops up when you’re driving over 75mph. That’s obviously an illegal speed in Britain, so you might as well have an illuminated sign saying ‘pull me over’ if the police are patrolling. Inside the A7, the dash is tilted towards the driver, and the driving position feels sportier and lower slung than before. The horde of buttons on the last model made things look too busy, so Audi has traded them for an infotainment system. The twin-screened unit now governs most of the Sportback’s media and comfort functions. The amended cabin is, therefore, an agreeable place to be, with an impeccable fit and finish. There's enough space for four adults, although the sloping coupe roofline means tall rear-seat occupants will have to stoop slightly. And when it comes to how much space there is in the boot, the 535-litres will easily swallow a bunch of golf clubs and a set of suitcases. If you want more room, all you need to do is get rid of your backseat passengers, fold the rear bench and, Voila, cargo capacity expands to 1390-litres. Overall, the economical 2018 A7 is an Audi that you'll be delighted to have parked on your drive. You'll also be thankful for the ease in which it conveys you to your destination, and for the clout on tap when you want it. In addition, the room in the boot and cabin makes this a coupe that's nearly as pragmatic as a saloon. What's more, this is a premium-badged automobile that states you're not over-the-hill yet. It declares you still have a bit of that maverick left within you – just!